The Air Jordan Alpha 1 won the hearts of many sneaker-lovers during its releases before. And this July, Jordan Brand will give us another treat with the release of the low-cut edition of this shoe, dubbed as the Air Jordan Alpha 1 Low. The low top version of the Alpha will debut this July 2011 in White/Black-Varsity Red colorway, which looks simple but very appealing to the eye. 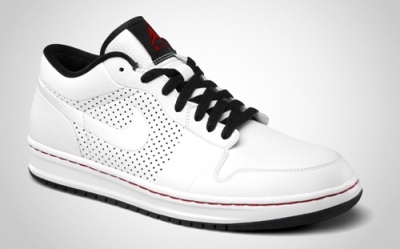 The Air Jordan Alpha 1 Low was built with a white leather construction that is accented with varsity red linings and black lace and outsole. Can’t get enough of it? Don’t worry that wait won’t be that long because this shoe will hit the market anytime this month! Check Out the New Jordan Alpha Trunner! Two More Jordan Ol’School IV Low Hit Shelves! Jordan V5 Grown CNVS Low Set to Debut This April! Two New Jordan Team ISO Low Hitting the Market This April!